A Batak style babi panggang, served with spiced blood as dipping sauce. Babi panggang refers to a variety of recipes for Indonesian grilled pork recipes, 'babi' meaning pig or pork, and 'panggang' meaning grilled or roasted in the Malay and Indonesian languages. Babi panggang Karo and Babi panggang Toba are two similar dishes made by the Christian Batak Toba and Batak Karo of North Sumatra. Pigs are slaughtered and used in their entirety to make babi panggang - bones for a clear soup, meat (including offal) to be grilled, and blood for a dipping sauce. The three dishes are served with plain rice and a sambal andaliman, made from fresh sichuan peppers. In other parts of Indonesia and also Malaysia, where the Chinese are the main pork-eating population, babi panggang may simply be a local term for standard Chinese pork dishes - babi panggang putih is siu yook (燒肉)), and babi panggang merah is Chinese char siu (叉燒)). 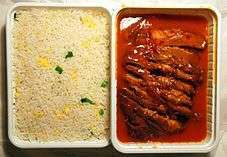 In the West, chiefly in The Netherlands, babi panggang is a pork dish served with a tomato-based sauce. This Dutch/Indonesian/Chinese fusion dish is also known as babi panggang speciaal in the Netherlands and its neighbour Flanders, and the sauce as speciaal saus (lit. : "special sauce"). This fusion version of babi panggang became popular in the Netherlands and Flanders through so-called "Chinese-Indonesian restaurants", common in the Netherlands since the late 1960s and early 1970s. These restaurants are mainly owned and run by immigrants from Hong Kong. The dish consists of slices of crispy deep fried pork served on a bed of acar campur (a pickle-like salad made with thinly sliced white cabbage and carrots of Indonesian origin; it is written atjar tjampoer in Dutch) over which a generous amount of the sauce is poured. It is highly probable that the dish was developed by Cantonese cooks, either in the former Dutch East Indies (present day Indonesia) or in the Netherlands itself after the large influx of Asians and Eurasians following the loss of its Indonesian colony and the advent of large scale international migration world-wide. The accompanying sauce for the Dutch version is similar to other tomato-based sweet and sour sauces common in Cantonese cuisine. Most recipes for this sauce include tomato puree, ketchup or fresh tomatoes, fresh or powdered ginger, water, vinegar, salt and a large amount of sugar. Recipes may also include onion, garlic, soy sauce, sambal, fresh chili peppers, sherry or rice wine, broth, MSG and cornstarch for thickening. Judging by the number of recipes found on the internet, this type of babi panggang sauce is becoming popular in many Western countries as a sauce for barbecues.